Quinton “Rampage” Jackson stars in a new commercial for Boost Mobile, highlighting that “Boost makes it easy to switch” and “Switching makes it easy to save”. Jackson, who is part of the Switch Crew, introduced by the telecommunications company last month, on August 1st, advises a young man to switch to unlimited gigs, telling him “You can take my workouts over the top”. After making the switch, the guy discovers that, with Boost, his possibilities are unlimited and that he can do it anywhere, from the park, the library, the bowling alley, to a family dinner and a hike in the mountains. “Unlimited gigs with unlimited workouts are yours. Boost makes it easy to switch. Switching makes it easy to save,” Rampage says at the end of the spot. 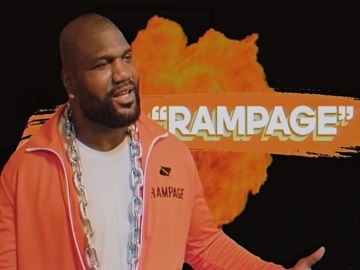 This is not the first time Quinton “Rampage” Jackson stars in a Boost Mobile advertisement. He was also tapped by the company to appear in a series of hilariously unexpected social videos created by agency Schiefer Chopshop, to coincide with his upcoming appearances in the Bellator Heavyweight Grand Prix, for a Boost Mobile social campaign that premiered January 19th. Viewers have thus got the chance to see another side of Rampage, revealed during “switched off” moments, which include blending up raw eggs with the help of a conflicted chicken, a comedic homage to the iconic pottery scene in Ghost, and even a relaxing bubble bath with his fluffy, green-haired dog, Gizmo. The Switch Crew, which comes to “save the world, one wireless woe at a time,” also includes MMA fighters TJ “Killashaw” Dillashaw and Juan “The Spaniard” Archuleta.